Goldenfeast Caribbean Bounty bird food is a delicious combination of 25 different vegetables, nuts, and fruit for all Medium to Large Parrots. Caribbean Bounty is the crème de la crème of nutritious treat foods. 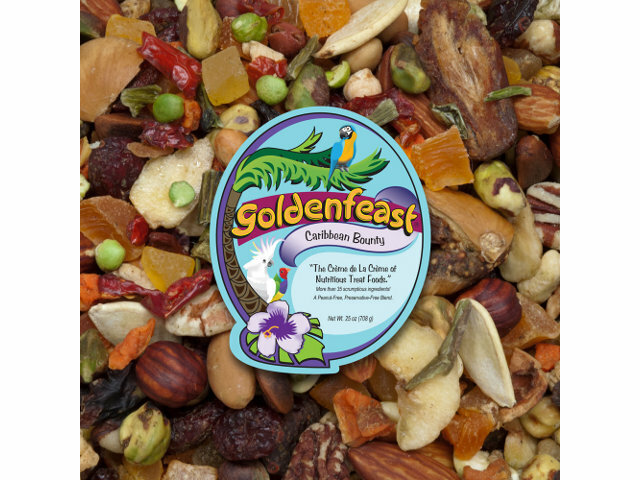 Like all Goldenfeast products Caribbean Bounty is made with human grade ingredients so you can snack on it along with your bird! Dehydrated apples, diced papaya, roasted almonds, unsalted roasted shelled peanuts, dehydrated carrots, cherries, white pumpkin seed, cashews, diced pineapple, mangos, cranberries, banana chips, shelled filberts, shelled macadamia nuts, pine nuts, dehydrated blueberries, whole dates, roasted in shell unsalted pistachios, shelled walnuts, dehydrated strawberries, pepitas (shelled pumpkin seed), jumbo flame dehydrated white grapes, dehydrated peaches, dehydrated zucchini, freeze dried garden peas, sweet peppers, dehydrated (cooked) red beans, dehydrated sweet potatoes, dehydrated (cooked) pinto beans and dehydrated (cooked) black eyed peas.